The Intercollegiate Ethics Bowl gives students a chance to enter an academic competition that combines excitement and fun with an educationally valuable experience in the areas of practical and professional ethics. Hundreds of students and teams across the United States and Canada compete in 11 competitions each fall. The teams argue and defend their moral assessment of some of the most troubling and complex ethical issues facing society today. Questions address a wide array of topics in business and professional ethics, in personal relationships, and in social and political affairs. Information about the history of official Ethics Bowl competitions can be found here. 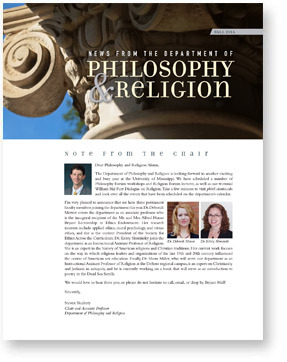 The Department of Philosophy and Religion is proud to organize and sponsor an University of Mississippi Ethics Bowl team each year. UM students from a number of different disciplines meet for a weekly ethics bowl practice, and then head to regional (and maybe even national!) competitions. The Ethics Bowl team also conducts an annual “Great Debate” for the public to highlight how controversial topics can be discussed and debated in a civil way. Students interested in joining the UM Ethics Bowl team should contact Dr. Deborah Mower.